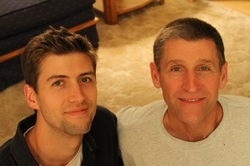 Me and my father, Paul. The 5th and 6th generation Cloeter pastors. At times I have been shy about my heritage, but never about who my father is. "What made you become a pastor?" My reply has always been, "I looked at what my dad did and I said, 'I want to do that.'" Dr. Andy Bartelt of Concordia Seminary, shares insight on "the generations" and my family on this post.